For over 158 years, YWCA of the City of New York has worked to eliminate racism and empower women. With a renewed presence at home, school, work, and in our communities, our reinvigorated commitment is empowering girls to develop into role models. Read our 2017 Annual Report to learn more. For over 158 years, YWCA of the City of New York has worked to eliminate racism and empower women. 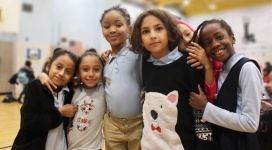 With a renewed presence at home, school, work, and in our communities, our reinvigorated commitment is empowering girls to develop into role models. Read our 2016 Annual Report to learn more. The YW has been working to help women and children expand their horizons. We are growing, we are transforming and we are leading. 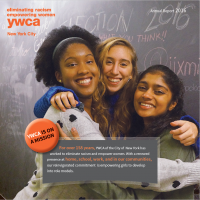 The YWCA NYC 2015 Annual Report covers programs initiatives and highlights and financial information from the 2015 fiscal year. The YW empowers girls to become empowered women; transforms the lives of children of all ages; and leads women to become who they want to be. The YWCA-NYC 2014 Annual Report covers financial information and highlights from the 2014 fiscal year. Serving New Yorkers for over a century and a half, the YW helps women and their children thrive at home, school, and work and within their communities. The YWCA-NYC 2013 Annual Report covers financial information and highlights from the 2013 fiscal year. We’ve been working for more YW! This means more opportunity, more success, more engagement, and more visibility. 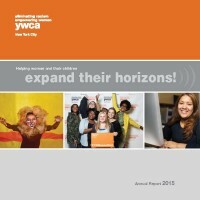 The YWCA-NYC 2012 Annual Report covers financial information and highlights from the 2012 fiscal year.